Dr Puttick completed an MSci in Chemistry at the University of Nottingham in 2008. He went on to study his PhD in ‘Probing the Nanostructure of Ionic Liquids using the Nuclear Overhauser Effect’ in Professor Peter Licence group at the University of Nottingham from 2008 – 2012. Following his PhD Dr Puttick moved to the University of Cambridge as a Research Fellow in the group of Professor Jennifer Morton to study MRI and MRS based biomarkers of disease progression in Huntingtons disease. 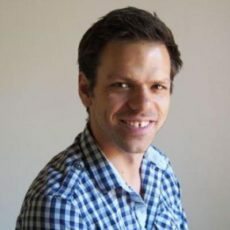 He moved to the Australian Institute for Bioengineering and Nanotechnology at the University of Queensland in 2013 as a Research Fellow in the group of Professor Andrew Whittaker. Dr Putticks current work is focused on the use of molecular imaging in driving the development of new diagnostic and therapeutic tools for cancer. He has a strong focus on the integration of positron emission tomography (PET), magnetic resonance imaging (MRI) and pharmacokinetic modeling to understand the mechanisms of uptake, retention and clearance of nanomaterials in tumours. In parallel, he has a strong research interest in developing robust methods for multi-tracer PET imaging.